Completed bedroom. Note the window light. 82 North Broadway, Nyack, N.Y. — When you paint in a great artist’s childhood bedroom, in space where the Hudson light seems a direct path from Heaven, off the river and straight up Second Avenue, you are humble. Humble even if you are simply covering a wall with latex, part of a sprucing-up after a fairly serious renovation. Recently, I was the artist in an artist’s bedroom, not doing artist’s work but trying to be artistic. I am a trustee of the Edward Hopper House Art Center and, along with Lynn Saaby, Dave Sirois and Brian Levine, we of the House & Grounds Committee try to offer as much volunteer repair work as possible. Giving free labor, and, often, materials, has been the secret of success in affording maintenance of the 1858 house where Edward Hopper, the famed American realist painter, was born in 1882. Ever since the once-deteriorating home was rescued by concerned citizenry and refurbished largely through volunteer work in the 1970s, the mantle has been passed from crew to crew to keep the iconic village structure in top shape. While these days that cannot always be accomplished with just volunteer expertise and labor, and focused fund-raising is necessary for infrastructure concerns (such as the ongoing drive to waterproof the basement), Hopper House continues to rely heavily on what labor and materials can be offered. I have been privileged to be among the volunteers, all of us taking cues from Win Perry, the Upper Nyack historian and architect, and his original 1970s restoration crew. 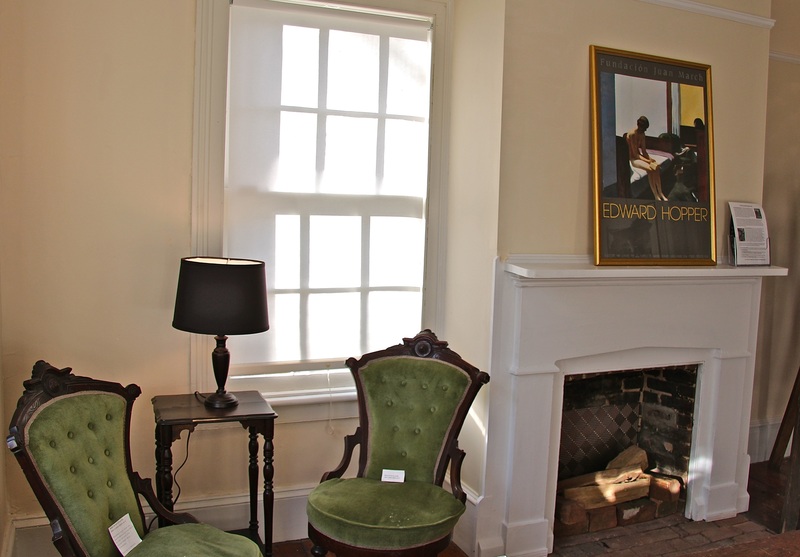 Those volunteers and early trustees saw to rewiring, heating, structure and wall repair, flooring and other work so that the art center could begin to offer space for artistry of all design and taste and to honor Hopper as as well as to rescue an old Nyack house. The mission continues more than four decades later. For whatever reason, a portion of Edward’s childhood bedroom, a particularly sunny part of the house on the southeast side, was never fully repaired. A long-ago water leak had deteriorated the original horse hair plaster on wood lath, and the wall on the south side, including the fireplace surround, had been removed down to the full-size 2×4-inch balloon framing, made of locally milled wood and which runs from the basement sill to the roof line. Over the years, the bedroom had been rented to various artists to help supplement Hopper House income, and those painters did not mind the rustic nature of the exposed wall, which included Haverstraw brick infill for mass and early insulation. Last year, the room was taken off the rental list and opened up to visitors eager to see Edward’s bedroom, where most likely he was conceived as it was the master bedroom until just after his birth when an addition was put on the north side. Hopper House decided then to complete the long-overdue repairs, which was to include new wall work, period molding, improvement of the fireplace hearth and paint. I got the job, and this volunteer spent about two weeks wonderfully enjoying the tasks. Each day, and some nights, it was inspiring to see the effect of both sunlight and moonlight in the room and to again realize that Edward, whose paintings are so very much about light, was obviously affected by constant nature in his bedroom. The birth of a great artist took place in this room, literally and figuratively. Repair work was made easier by a large table, perhaps 4 feet by 12, which Edward built in his Washington Square, New York City, studio to dry printed black and white line drawings from copper plate etchings. (Hopper House was given the table by Edward’s neighbor after the man, a professor, retired a few years ago. He had received it from Jo Nivision, Edward’s wife and fellow painter.) I was careful not to damage the rustic oak table, and it sure came in handy. The wall repair was quick enough, using drywall and a finish that mimics plaster. The moldings required extra work since we had to match them with what might have existed, or at least come close. I mixed this and that profile and hand-milled some pieces to achieve the desired result. In the end, the restored wall fits the original bedroom, itself the inspiring scene of several Hopper paintings. It may not be perfect, for I am but a volunteer craftsman, but I took pains to respect the house and the artist. No, I did not channel Edward Hopper, which might seem a temptation, especially when you are in the bedroom at 8 a.m. on a bright, sunny day and the light streams up Second Avenue through the large windows and onto the walls. But neither can you ignore the fact of his existence, his childhood and early adulthood in that room. As a writer, photographer and painter, I can call myself an artist, though that definition bears no resemblance to artist Edward Hopper. Yet if there is kinsmanship at all, it was a bit brotherly to be working in the great man’s bedroom. The writer is a retired newspaperman who long toiled for the original Journal-News at 53 Hudson Ave., Nyack. This essay recently appeared in the newsletter of the Nyack Historical Society. It may be reprinted. Here’s a story. A very human story. One that might remind you of your mom. And a cold day. And simple soup. And a complex world. We have been having old-fashioned winter in the Northeast, not as bad in New York State as in New England, but quite cold — single digits and enough snow to double the effect. Not too bad if you have today’s central heating, a warm car with electric seats and a climate-controlled workplace. But not so good if you are homeless or otherwise stand in line at 7 a.m. waiting for a local volunteer breakfast program to open its doors. One recent Tuesday, during a storm that prevented five of the six volunteers from hitting super-icy roads in the wee hours so they could prepare breakfast and a bag lunch, a line of hungry people formed outside United Church in Spring Valley, N.Y., where, since 1985, the Rockland Interfaith Breakfast Program has unfailingly served daily. So far in 2015, an average 100 people, sometimes as high as 150, queue up to eat what the cook of the day and the other volunteers put together. Tuesdays is always pancakes (pancake flour, brown sugar, honey, vanilla, eggs, milk, coffee); Polish sausage (two-inch pieces, baked for 2.5 hours at 220 degrees in apple juice, with seasonings, sweetness); oatmeal (also flavored and with raisins, not boiled but simmered in a boiled mixture); and soup (might be canned mixed vegetable or minestrone, seasoned and simmered for two hours). There are desserts, juice, milk, coffee as well. Then the fellows and gals take a cold bag lunch. On the recent stormy Tuesday, only one of us was able to get in, and by luck, that was me. I could not prepare the fine lunches the ladies do (I have five girlfriends at RIBP, I am the only male Tuesdays). I also could not get desserts out, but I did do the pancakes, sausage and, most of all, the soup. This was a soup day if ever there was one, with temps at maybe 10, with most of the homeless sheltered overnight at the church in the Helping Hands program, also run by volunteers and Ya’el, the director. But not all the homeless chose to stay inside, as is the way with independent people who harden to adversity. We also had in line men and women who hoped to shape up for whatever shoveling or other work that local contractors might offer. So, it was very cold, the line to get in was long despite the storm, and awaiting them was nourishing, tasty food. But what was the hit of the morning? It was the soup, this time canned chicken rice simmered several hours with pepper and parsley plus other flavorings. The entire serving area was filled with the fragrance of that soup, that simple offering. I worked the ladle, and as the people came up and received a large foam cup of very hot soup, as the steam of that hit their chins, almost to a man and woman, their noses dropped to the rim and they took in the smell of the soup. In English, in Spanish, in Creole, you heard “thank you,” but it was as if these good people were not thanking the fellow ladling the soup, or the breakfast or overnight staff, but their moms. Just about all of us recall playing in the snow, walking home from school in February, horsing around with pals on a Saturday, and mom called us in — friends, too — for steaming tomato soup with noodles, or chicken soup with rice. Homemade, canned with seasoning and noodles added, whatever, the hot soup was proof that moms existed, for those lucky to have one. And affirmation that someone cared. That was the look on those men and women, in a small but significant, long-serving volunteer food program that asks no questions, makes no judgment and does some good. Sometimes a person comes along as if the moment were a conversation with a plane passenger whom you’ve just met and who will soon move on to her own destination. Yet, however short the time, there is a connection that cannot be forgotten, though it is also not something you dwell upon. It is reassurance that life isn’t just about getting through things. That is what happened to me so long ago now, about 1970 when a newspaper colleague and I found we were often on the same assignment, she a writer, I a photographer. Town Board meetings can be long affairs, with downtime, and you shoot the breeze. Diana was an involved conversationalist, and we both began to look forward to exchanging thoughts. She listened, I listened, and the mutuality of that recognition of worth proved key to friendship. This wasn’t romance, the conversations, but the growing strength of expectation, of sharing words, was ardent in itself. Diana could enter sentences I began, and I hers, and that had happened to me only once before. It is a gift when there is such synchronicity, when there are goose bumps from the understandings made, the reaches into another being realized. It is a purring moment, like two friendly cats comfortable with each other. You cannot invent such relationship — it just happens. A few months after our conversations, I would move from photography to the news desk and then on to editing and eventually editorial and column writing, and Diana would marry Al and move to New England for a very long and happy relationship. I would say we simply lost touch, though there never was any thought of keeping a connection, and except for two brief but sad greetings when her parents died some years back, I had not heard of or from Diana. Now I have. I am told by her brother, who was my school classmate, that Diana passed Feb. 1 after a long illness which even he knew little about. Diana apparently wanted no one to suffer with her, not surprising given the breadth of her compassion for others in those long-ago conversations. In my remembrance of her after I heard the news, I can hear the words, see the gestures, feel the human connection between two friends in a public meeting hall. You cannot underestimate having a special friendship forged in a moment, not celebrated much beyond that but somehow an eternal one. And I am eternally grateful, Diana. The writer is a retired newspaperman who can be reached at ahgunther@hotmail.com. Being bored is good, kids. Skip the video game, the phone, the computer and all the scheduled activity. Take a walk, sit under a tree, in a library corner. Climb a branch (safely), go down to the river, lie on on a pier, scale a snowbank. And do any of these things alone, with no friends. No mom, no dad, no friend, no teacher. Give yourself an hour to do nothing. Get bored. Very bored, and just when you think you are going to burst from inactivity — from not checking your phone, from not hitting the video game console button, from not jabbering away with friends, from not jumping, once again, into the family car for a trip to dance, yoga, karate, Scouts, whatever is structured, just when you are about to throw in the towel, I bet a light will come on. In your brain. In your muscles. In your heart. In your being. Eureka! Boredom may seem as if you are running in place forever, but what it actually does is to eventually propel you like a wound-up rubber band on a toy balsa airplane propeller, soaring into the sky and them gently gliding. Boredom makes you look inside. It scavenges your brain for all those buried bits of creativity that you noticed — colors, forms, shapes, ideas, thoughts that you can build upon in your own creativity, artistry, problem-solving. You cannot do this, take that journey, an exquisite run, if you are so focused on the selfies, the messages, the functions of your TV remote. Let the mind wander. With no one else around, you become your own best exploring buddy. and it can be fascinating. Even boring, repetitive tasks can stimulate creative thinking, as the hand does the routine work and your brain flies off for a moment or two. Being bored, and finding results, can boost your esteem, add to purpose, bring motivation. Sit on a street bench and count the cars, take an imaginary trip in one of them. Life isn’t just about excitement or stimulation. It is about intentional boredom and where it can take you, kids.